The goal of this design document is to record and present the proposed method for Volume snapshotting in Synnefo. We will describe the whole work-flow from the user’s API down to Archipelago and up again. The snapshot should capture the volume’s data state at the time the snapshot was requested. Note: The VM user is accountable for the consistency of its volume. Journaled filesystems or prior shutdown of the VM is advised. Users can view their snapshots in Pithos as any other file that they have uploaded and can subsequently download them. Essentially, if a snapshotted volume includes an OS installation, it can be used as any other Synnefo OS image. This allows users to create restoration points for their VMs. If many users send snapshot requests, the service should be able to respond quick. Also, a snapshotted volume should not incur any significant storage overhead. If a snapshot request fails, the system should do the necessary cleanups or at least make it easy to reconcile the affected databases. The Cyclades App receives a snapshot request. The request is expected to originate from the user and be sent via an API client or the Cyclades UI. A valid snapshot request should target an existing volume ID. 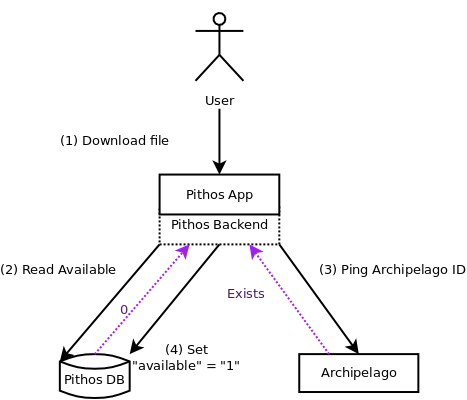 The Cyclades App uses its Pithos Backend to create a snapshot record in the Pithos database. The snapshot record is explained in the following section. It is initially set with the values that are seen in the diagram. The Cyclades App creates a snapshot job and sends it to the Ganeti Master. The Ganeti Master in turn, designates the snapshot job to the appropriate Ganeti Noded. The Ganeti Noded runs the corresponding Archipelago ExtStorage script and invokes the Vlmc tool to create the snapshot. The Vlmc tool instructs Archipelago to create a snapshot by sending a snapshot request. 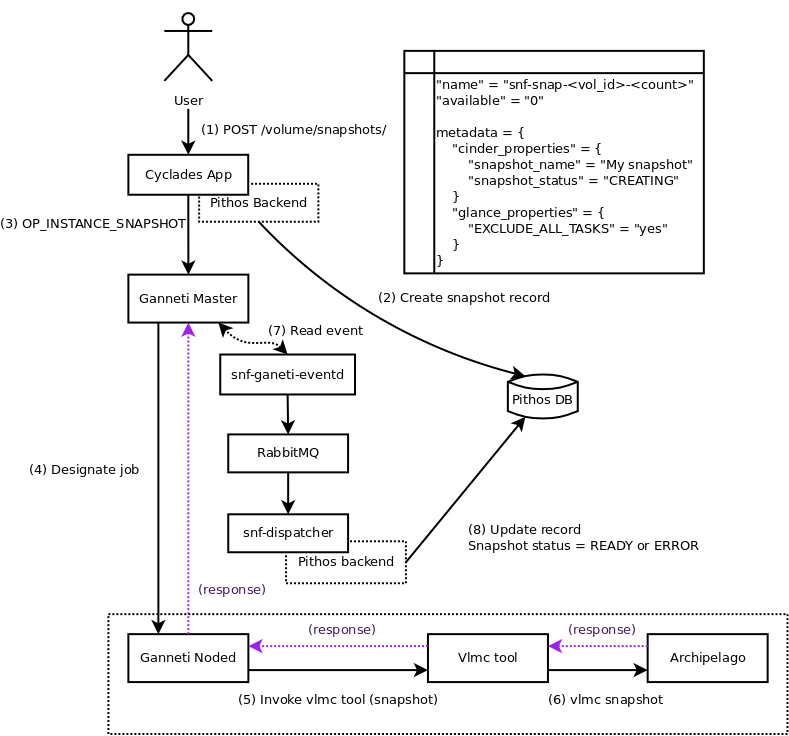 Once Archipelago has (un)successfully created the snapshot, the response is propagated to the Ganeti Master which in turn creates an event about this snapshot job and its execution result. snf-ganeti-eventd is informed about this event, using an inotify() mechanism, and forwards it to the snf-dispatcher. The snf-dispatcher uses its Pithos Backend to update the snapshot status property of the snapshot record that was created in Step 2. According to the result of the snapshot request, the snapshot status is set as Ready or Error. This means that, as far as Cinder is concerned, the snapshot is ready. The Available attribute however is still 0. Swift (Pithos) will make it available (1) and thus usable, the first time it will try to ping back (a.k.a. the first time someone tries to access it). <counter> is the number of times that the volume has been snapshotted and increases monotonically. The snapshot name should thus be unique. The available attribute is a Swift attribute that is introduced with snapshots and applies to all Pithos files. When a Pithos file is “available”, it means that its map file has been created and points to the correct data. Normally, all Pithos files have their map file properly created before adding a record in the Pithos database. Snapshots however are an exception to this rule, since their map file is created asynchronously. If the file is a snapshot, the available attribute is set to “0”. For all other files, the available attribute is set to “1”. Note: available can change from “0” to “1”, but never the opposite. The update of the available attribute happens implicitly after the creation of the snapshot, when a request reads the file record from the Pithos database. The following diagram shows how can a request (download request for example) update the available attribute. The user asks to download the file from the Pithos App. The Pithos App checks the file record and finds that the available attribute is “0”. It then pings Archipelago to check the status of the map. If the map exists, it sets available to “1” and can use the map file to serve the data. The following diagram illustrates the VM creation process from a snapshot image. A user who has the registered Images list (which includes all Snapshots too), requests to create a VM from the Cyclades App, using one of the registered snapshots of the list. If the template is ext, then the “origin” field has the archipelago map name. For any other template, the archipelago map name is passed in the “img_id” property of OS parameters. The Ganeti Master designates the job to the appropriate Ganeti Noded. The Ganeti Noded runs the corresponding Archipelago ExtStorage script and invokes the Vlmc tool. The Vlmc tool instructs Archipelago to create a volume from a snapshot. If the disk template is other than “ext”, e.g. “drbd”, Ganeti Noded creates a new, empty disk. If the disk template is “ext”, there is no need to copy any data. Also, the image has the “EXCLUDE_ALL_TASKS” property set to “yes”, so snf-image will run no customization scripts and will simply return. If the disk template is other than “ext”, e.g. 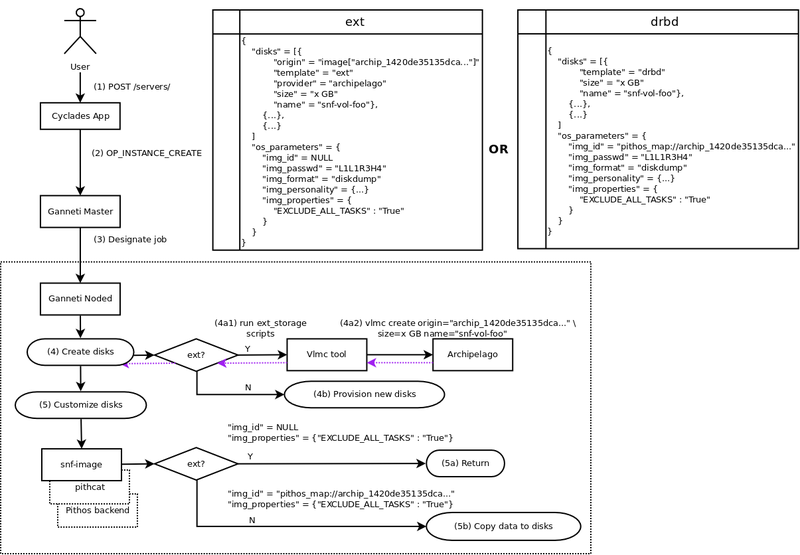 “drbd”, snf-image will copy the snapshot’s data from Pithos to the created DRBD disk. As above, since the image has the “EXCLUDE_ALL_TASKS” property set to “yes”, snf-image will run no customization scripts.